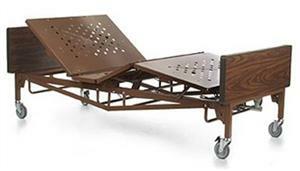 Bariatric Home Care Hospital Bed Package is a heavy-duty, full-electric bed frame capable of supporting up to 750 pounds. Designed with the bariatric patient in mind, the bed frame extends to the edges of the bed deck for better support than most other split-spring bariatric beds. The hand pendant features dynamic client positioning, allowing the consumer or caregiver to change the positioning of the head and foot sections as well as the bed height. Despite its size, bed setup within the home is easy - no specials tools are needed. Evenly distributed total weight capacity including patient, mattress, rails and accessories is 650 lb. / 750 lb.